The MoVeS OxyCycle 2 Pedal Exerciser is a great tool for personalised, low-stress workouts that can be used anywhere. The 60 Watt motor offers enough power to maintain a constant rotational speed. The MoVeS OxyCycle 2 Pedal Exerciser is a great tool for personalised, low-stress workouts that can be used anywhere. The adjustable speed makes it a great product to progressively strengthen your arms and legs. This pedal exerciser provides low impact exercise to increase strength and flexibility, is versatile for both upper and lower body and it improves the blood circulation. 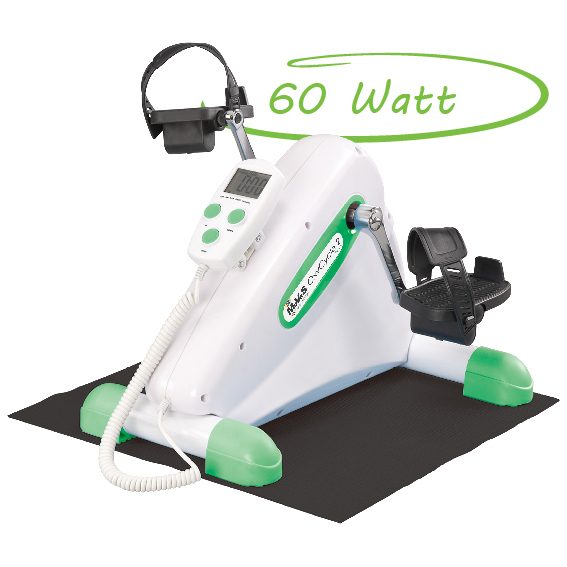 The MoVeS OxyCycle 2 Pedal Exerciser has a 60 Watt motor to offer enough power to maintain a constant rotational speed, whereas cheaper models only carry a 30 Watt motor. A safety stop will avoid injury in case of cramp or muscle spasm. The MoVeS OxyCycle 2 has a light-weight compact design, adjustable speed and a multi-function LCD display readout scan, time, count, RPM-level and estimated calories burned. A non-skid mat and interchangeable handgrip pedals are included. For PASSIVE training only. Home use only. Check our other pedal exercisers here.